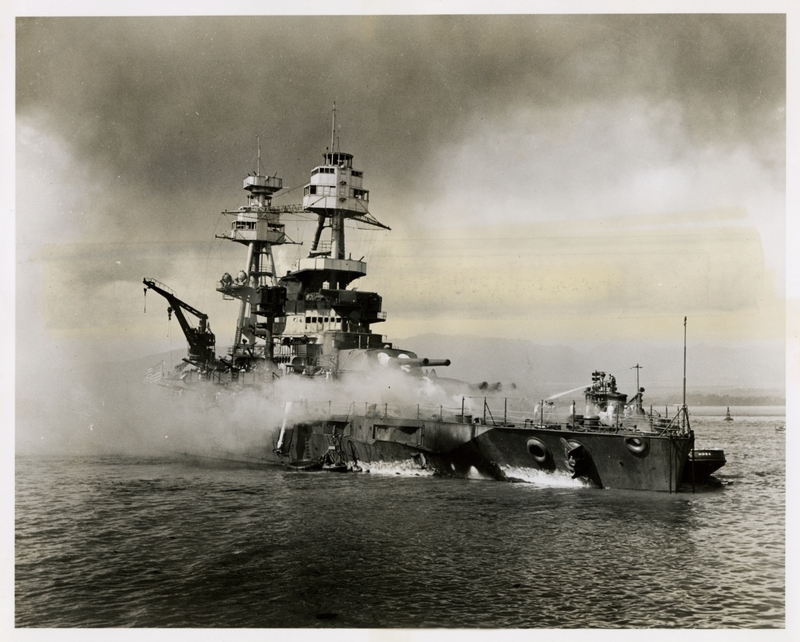 The USS Nevada, beached at Hospital Point, near the mouth of Pearl Harbor. While attempting to escape the harbor, the Nevada received several crippling hits from Japanese bombers. In order to prevent the Nevada from sinking directly in the middle of channel (which would effectively block all traffic in and out of the harbor) the yard tug, USS Hoga, pushed the Nevada into shallow water and out of danger. The Hoga is pictured here fighting a fire in the Nevada's virtually destroyed forward section. This photograph is part of a series of photographs from the U.S. Senate investigation of the Japanese attack on Pearl Harbor, 7 Dec. 1941.